A great gutter system makes all the difference in keeping your home dry, safe, and solid. Our seamless and affordable gutter system is handcrafted on site and tailored to your home. Our seamless and heavy gauge aluminum 5″ or 6″ gutters and downspouts directs water away from your walls and foundation. We proudly offer many colors to choose from. 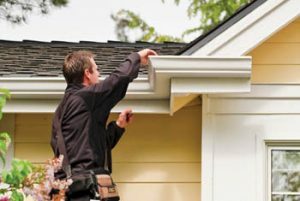 Our installed gutter systems include a Lifetime Warranty on materials and labor, ensuring that not only is your home protected from water, but you also have peace of mind. We also offer a Gutter Guard product that eliminates future cleaning or clogging of your gutters! Having good rain gutters on your home is an absolute necessity because there’s nothing worse than water going where it’s not intended to go. If it’s time for gutter replacement, you can count on our team of experts to make sure that the job gets done the right way the first time around, minimizing the risk of water damage to your home–and making it look great in the process! At West Knox Windows and Siding, we are also proud to offer roofing installation in both traditional asphalt dimensional shingles and metal roofing. Once again, there are many colors to choose from to suit your particular needs.